Hoops Mania is completely addicting sports & skill game fun. It's time to go big or go home with Hoops Mania, the best basketball shooting game of all time! 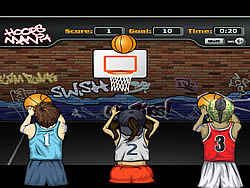 You control three different street players trying to wrack up as many baskets as you can in 30 seconds.